Our New Castle County lighting instllation and design experts can design a lighting system complete with fixtures, custom switching and dimming so that your lighting options can reflect your mood or make a room multitask for you. There is nothing that shows off your New Castle County home’s interior more than a good lighting scheme. 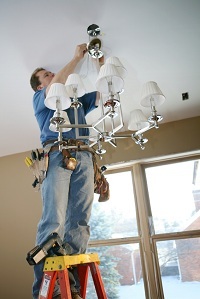 Your home’s lighting also must be functional and flexible with the way you live in your New Castle County home. There are many different facets in choosing indoor lighting for the rooms in your home. At Electrical Solutions, our New Castle County lighting installation experts can help you improve the look of your home by designing and installing a lighting scheme that fits the needs of your New Castle County home.